A fully fledged Knowledge Base to help Restaurants find solutions. We have many documents that can help you for your reference. Changing Your Restaurant's Opening Hours? Can I get takeout & Dinein? Yeah, sure. Go for it! However, not all restaurants offer this as an option. Something is wrong with my food!? Contact the restaurant as soon as you notice something is incorrect or needs to be edited with your order. They can make those adjustments for you and will notify us directly if any refunds or additional charges need to be made. 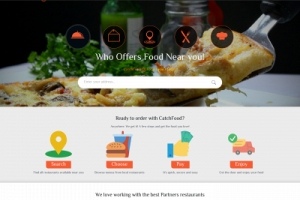 The vast majority of menu prices on CatchFood will be the same as they are in-store. Can I place an order for a future datetime? Many of our restaurant partners allow customers to submit orders for future dates/times. Go ahead and make your order selections and you will be able to submit your order for "now" or "later". If you don't see this option, the restaurant has likely chosen not to offer this option. How does my account stay secure? All customers' accounts can only be accessed with the correct login email and password in addition to being encrypted. Your credit card information will be saved only if you choose to do so, meaning your food secrets are safe with us! Copyright© Catchfood Restaurant Support All rights reserved.